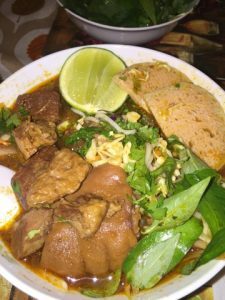 My husband has been asking for bun bo hue for weeks but it’s just so hot here that I didn’t want to have a broth simmering in the kitchen for over 4 hours. But after using the instant pot yesterday to make red beans & rice…I decided to give bun bo hue a try in the IP. I have to be honest…I prefer the stove version more ….but I think I haven’t gotten the right constituency of the meat being as tender yet. Plus the pot is so small that I didn’t use all the MEATS that I usually used when I am making it on the stove. Bún bò Huế or bún bò is a popular Vietnamese soup containing rice vermicelli (bún) and beef (bò). Huế is a city in central Vietnam associated with the cooking style of the former royal court. The dish is greatly admired for its balance of spicy, sour, salty and sweet flavors and the predominant flavor is that of lemon grass. Compared to phở or bún riêu, the noodles are thicker and more cylindrical. 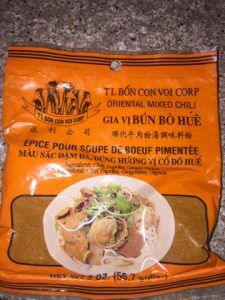 This is why it’s my favorite Asian soup. I love it for the spicy and the lemongrass flavor and aroma. 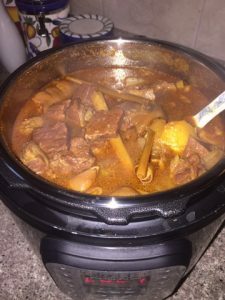 Instant Pot: The small kitchen appliance is a versatile multi-cooker that can do the job of a pressure cooker, slow cooker, rice cooker, steamer, and more, and also saves you counter space and money. REMEMBER TO USE ONLY ONE NOT BOTH IN THIS AMOUNT!! If you want to use both then adjust accordingly because the shrimp paste is VERY VERY SALTY!! I added the chili powder and cayenne because we LOVE IT SPICY!! You can omit them if you don’t like it super spicy. Fill a large pot with water and blanch the chuck roast and pig feet. If you are using different types of meat..I highly recommend you blanch all your meats before you cook it in the IP. This takes out all the gunks..it’s different when you cook on stove because you can strain it out during the cooking process but with the IP you can’t open up the lid. Look at all the gunk here in the blanching process. Once the water start to boil…cook for another few minutes. Next, dump the meat into a colander and wash well before placing in the IP. Once the meat is blanch and wash really well of all the purity. Place the meat back into the IP. Next, add the lemongrass, onion, ginger and rock sugar. Add the rest of the seasoning. Then fill with water. JUST ENOUGH TO COVER EVERYTHING. Remember to not pass the MAX LINE!!! I ACTUALLY didn’t fill up to the MAX line because I know the pig feet and chuck roast will render more liquid and I don’t want it to spill over. Spilling over can mess up your IP. Set timer to “soup” setting then adjust to 80 minutes. 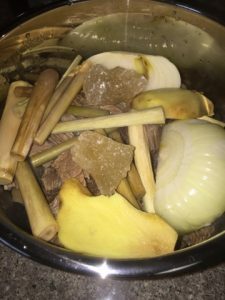 Some of my friends that I have talked to program their bun bo hue to 1.5 hrs but I only used chuck roast and had already cubed it into small chunks. Didn’t wanted my meat to be too too tender that it becomes mushy. Next add the bun (noodle) to a BIG BOWL and any of the veggies (red cabbage, herbs, bean sprouts) and ladle in your broth. I also like to add in pork patty (gio/cha Lua) that I purchase from the ASIAN market. Garnish with thinly sliced onion, chili, and squeeze in some lime or lemon. Be VERY CAREFUL IF YOU ARE GONNA DO A QUICK RELEASE the STEAM VALVE because it is VERY VERY HOT!! What I usually do is place a kitchen towel over the valve and taking a wooden spoon (standing at a distance) I switch the valve with the wooden spoon. First time it will scare you!! Also make sure no little ones are around or nothing is over the stem valve. 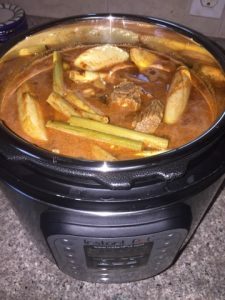 When using an instant pot ALWAYS be CAREFUL!! !